Amlodipine is a so-called calcium blocker. The effect of this drug causes the blood vessels to dilate, so that the heart requires less oxygen, and the blood pressure is lowered. 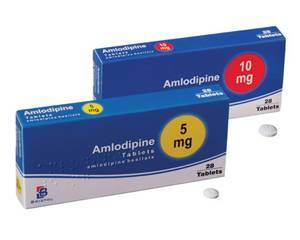 Amlodipine is used to treat high blood pressure, heart spasm (angina) and Raynaud's syndrome. Amlodipine should be administered at a fixed time. It is a good idea to use the pills in the evening, if you suffer from giddiness. Amlodipine is available in tablets of 5 and 10 mg. Ask your doctor, what strength you should take. The usual dose is one tablet once daily. Please always follow the doctor's advice. A missed dose can be taken up to 16 hours late. Never take two tablets of Amlodipine at the same time to catch up for a forgotten dose. In case of an overdose, dangerous low blood pressure may occur. Warning: always consult a doctor in case of overdose. See leaflet for a list of other side effects. Talk to the doctor about the use of Amlodipine, if you suffer from (one of) these or other conditions. For a list of contraindications, see the Package Leaflet. Pregnancy / lactation There are few data on the effect of Amlodipine on a fetus or infant. Talk to your doctor about the use of Amlodipine, if you are pregnant, planning to become pregnant or breastfeeding. Inform the doctor or pharmacist, if you are taking one of these drugs or other drugs. As Amlodipine lowers blood pressure, you may feel dizzy at the start of treatment. Normally, these symptoms will disappear in the course of using the tablets. You should not drive until the symptoms have disappeared. Alcohol causes the blood vessels to widen. Amlodipine does the same. This may increase the side effects and dizziness, which may occur. Caution with alcoholic beverages.